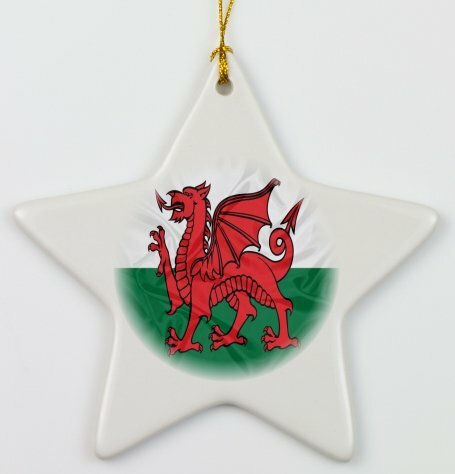 After seeing the vast and rich array of decorations available for my Irish cousins, I'm admittedly a little disappointed that there's not more for the Welsh. 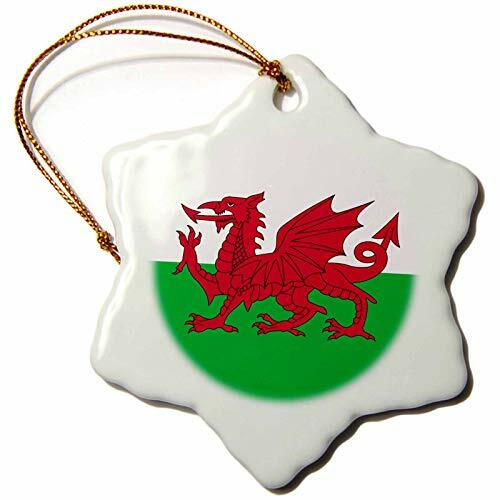 However, there are Cymru Christmas ornaments out there; and I've been hunting for hours to round them all up into this Wizzle. 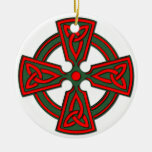 If you have any Welsh heritage at all, then you may like to include that Celtic touch in your Yuletide decorations this year. 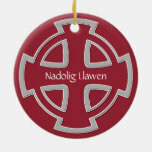 That's 'Silent Night' in Welsh by the way! Enjoy the beautiful language of my people. 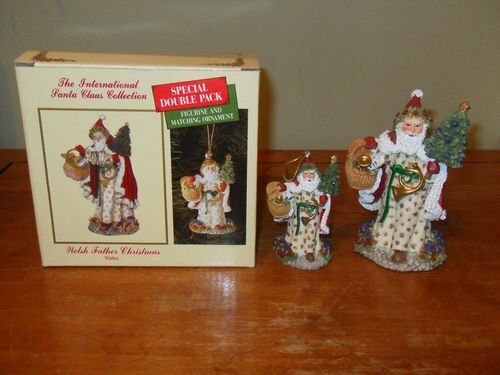 This rare double decoration set, from the International Santa Claus Collection, is billed as the Welsh Father Christmas. But we all know who that is - Siôn Corn! Every Christmas, the Welsh Santa Claus comes to leave presents for all (good) boys and girls. Siôn Corn enjoys the mince pie and milk left out for him, then takes off to visit the next house. He has to fit in visits to every cartrefydd in Wales, flying in his magic sleigh pulled by reindeer; then zoom off to find the little Welsh children all over the world. Busy night! Siôn Corn is depicted here as a Christmas tree decoration and a five inch free-standing ornament. 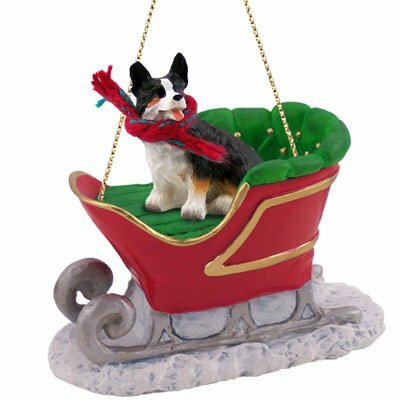 This hardboard ornament measures 3.5" wide by 2.5" tall. 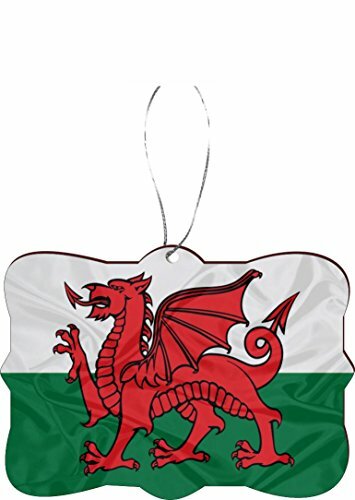 It will add a ferocious bit of Welsh pride to your Christmas tree. Then you can leave it out for St David's Day at the beginning of March. Two holidays for the price of one! 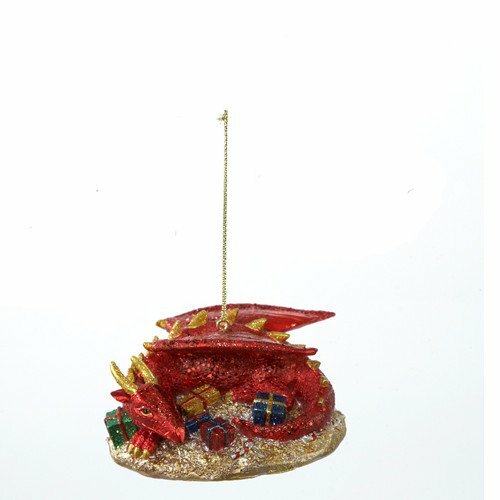 If the hardboard version isn't doing it for you, then there are plenty of alternative Y Ddraig Goch decorations to hang on your Christmas tree. Like the two over on the right. The last 'ch' there is soft, like in 'loch' or the 'c' in 'cat'. The Red Dragon has been the symbol of Wales since Lludd (and later Merlin) had a vision down in a cave. It appeared on the flags, whenever the Welsh had a presence on the battlefield, in the 12th century; and Owain Glyndŵr raised in when he liberated Wales in 1400. 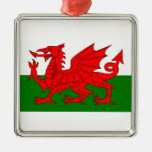 Ok, this one is a little tenuous, as Kurt Adler didn't actually say that his resin red dragon is particularly Welsh. But it's red, it's covered in glitter and it's hoarding presents. Looks like Y Ddraig Goch to me! And if it's not, then consider this a take-over on behalf of the whole Welsh nation. As it's by Kurt Adler, you know it's high quality. I love the happy accident of the Welsh flag displaying the colors most commonly associated with Christmas anyway! 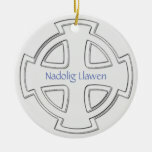 In this pewter Zazzle decoration, Y Draig Goch is depicted encircled by wonderfully festive words - joy, peace, love, live - like a talisman against the Lords of Misrule. Let the darkness come, and the winter too, the Red Dragon will show the way and we - joyful, peaceable, living in love - follow into the bright dawn of a new year. Cymru is the Welsh word for Wales. It means 'brotherhood', while Wales translates as 'foreigners' in the old Saxon tongue. True facts! Learn to Sing a Welsh Christmas Carol! Elmo5242 - born and bred Welshman - teaches us how to sing 'Nadolig, Nadolig' (Christmas, Christmas). Enjoy! Now that Elmo has taught you how to say 'Merry Christmas' in Welsh, then this is a good moment to grab that greeting for your tree! Time for another Welsh pronunciation guide. If you watched the YouTube video, then Elmo says merry Christmas in Welsh at the end. But for completion sake, I'll tell you too. Nadolig = na-doll-eeg I do like how Elmo says that it's like 'no dolly' but with a 'g' on the end! Much giggling happened here at that. Put the tip of your tongue against the back of your top two front teeth. Now just breathe. Don't try to force a sound. The breath is it. That's 'Ll', and all you have to do then is add 'aw-wen'. Is it wrong that I have the giggles? 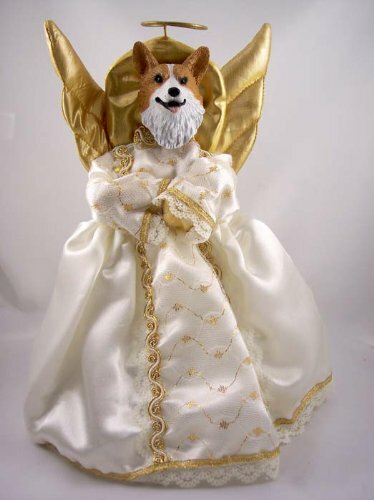 It's an angel with a corgi head. I reserve the right to smile over this one, as it's surely meant to be humorous. 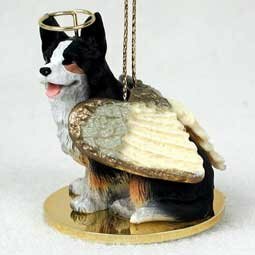 Of all the dogs in Wales, the corgi is the most famous, mostly because Queen Elizabeth II loves the breed so much. She always has at least four running around Buckingham Palace; though not on top of her Christmas tree. Originally, these dogs were running around the Pembroke and Ceredigion hillsides, herding sheep. Many of them still are! 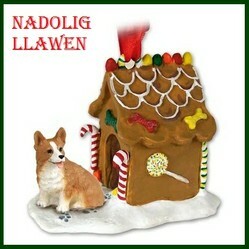 Corgi is also famous for being one of the most successful infiltrations of the Welsh language into English. The name is Welsh - cor means 'stunted' or 'dwarf' and ci means 'dog'. 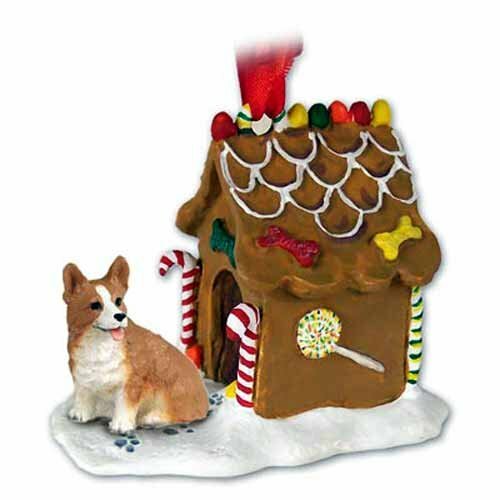 Cor + ci = dwarf dog, though the 'c' mutated into a 'g', hence 'corgi'. 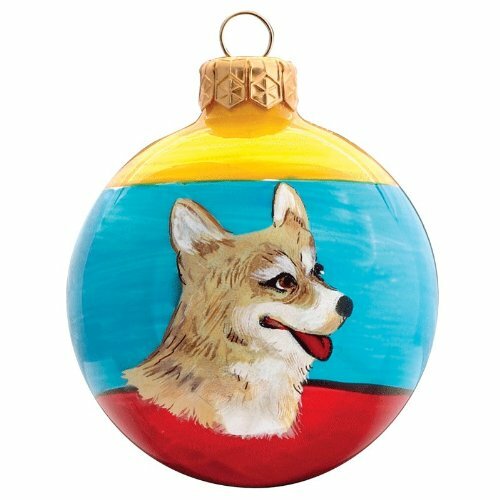 The Welsh Corgi (so beloved of the royal family) appear to be in vogue this Christmas, but there's also one with Nadolig Llawen in festive gold. Is it good or bad that I know exactly where this photograph was taken? The Deeside Caffe-Bistro (no, I didn't misspell cafe, it's Welsh) has a little platform right over the River Dee in Llangollen. You can sit on tables and chairs there, though probably more so in summer. The photographer was either on there, or hanging right over the stone wall of the bridge above. Frankly, I don't blame them! Llangollen is beautiful at any time of year, but the winter snows add an even greater wild beauty to the rapids of the River Dee. I'm nostalgic for this scene, and I don't live too far away from it! 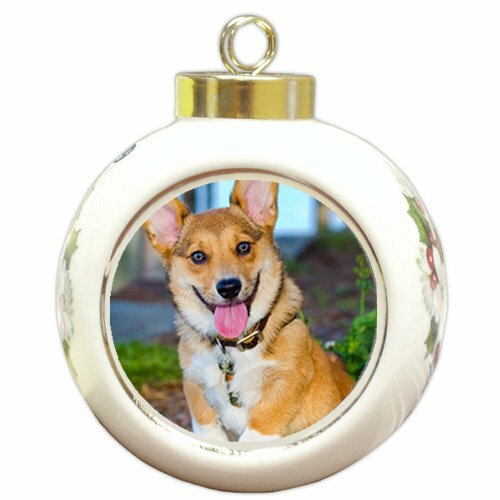 In fact, the original ornament disappeared, so I went there to create one of my own! These are all from my own Beautiful Britain Zazzle store. Depicted are scenes from Wales on Christmas decorations, that I photographed and posted myself. And that's your lot! 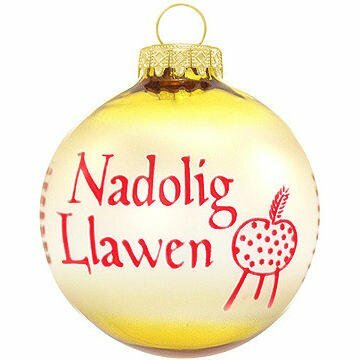 Wishing you all a very nadolig llawen from all of us here at Wizzley; and here is how Welsh men sing, just to finish us off here. Jo Diloch yn fawr from a exiled Welsh man in Bangkok. You had me at Wales! I want to know more about the Red Dragon!! So interesting that a fantastical creature shows up on a flag. I guess you didn't write more about it because people know about it, but I find it fascinating. Bendigedig! Did you sing along with him? A Video teaching Welsh that I haven't seen!! !